A commercial for a male enhancement drug featuring a black actor frightened white viewers. During a Fox News broadcast last week a black man briefly appeared in a commercial. Many viewers of broadcast were startled, confused and frightened by the appearance of the black man on their television sets and called 911. Within five minutes of the commercial airing on Fox News, 911 operators received 100 calls reporting that a black man had broken in to viewer’s homes. 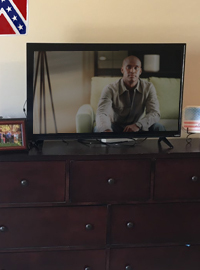 The commercial, for a male enhancement pill, featured one scene, lasting less than three seconds, with a black male actor. Fox News representatives apologized for the confusion and promised to never broadcast a commercial featuring any non-white actors on the network again.